St. Christoph is a tiny settlement during the summer and a bizarre skiing-theme-park during the winter. Situated on the Tyrolean part of the Arlberg Mountain, the Olympus of Austrian skiing mountains, it is not surprising that St. Christoph fails completely in providing anything like authenticity. 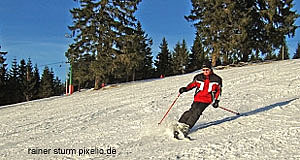 It is know for skiing, skiing and more skiing - oh, not to forget snowboarding. Anyway, St. Christoph has quite a legendary skiing school and its claim to fame is to be the "highest skiing-resort in the Alps". I am always suspicious when it comes to superlatives and think that there might be a few villages that could contest St. Christoph in this area. Nevertheless, St. Christoph′s altitude of 1,800 metres are indeed quite impressive. Back to the background information: St. Christoph is not a community in the administrative sense of the word. It is a hamlet or part of St. Anton. Austrians usually know it as a very posh skiing destination and the "Hospiz" alongside with its associated brotherhood - the "Bruderschaft St. Christoph". The Bruderschaft is something like a guild and was originally founded in the 14th century by an orphan named Heinrich von Kempten. Heinrich was a native of the Allgäu, a nearby area in Southern Germany. In 1386, he raised a significant amount of money for the foundation of a shelter - the "Hospiz". It meant safety for troubled travellers in bad weather and built in St. Christoph. In the mid-20th century, the Bruderschaft St. Christoph was re-founded by the local Arnold Granahl, who happened to be the landlord of the Hospiz. Originally, it was dedicated to fundraising for local orphans. However, over the decades it developed into something like a particularly elitist version of the Lion′s Club. Over the course of the years - with generations of posh skiing tourists coming and leaving - the Bruderschaft gained a significant number of members. Today, it somewhat pompously claims to be the biggest charity in the World (what was that about superlatives..?) with some 15,000 members. Some of these are quite significant, including royals from Spain, the Netherlands, Liechtenstein (he of the Palais Liechtenstein in Vienna) and Saudi Arabia. The "Hospiz", however, has developed and is no longer a shelter - today, it is a luxury hotel. Beyond that, there are several bars and traditional "Gasthof" style pubs in St. Christoph. As you might have expected, the appeal of St. Christoph in terms of sightseeing is rather limited - however, there is the "Bruderschaftskapelle" Chapel, which might be worth a closer examination. Attractions nearby include the other towns of the Arlberg region: Klösterle, Pettneu, St. Anton, Lech, Zürs and Stuben. For a slightly further drive, go to Landeck or Imst. Days with bad weather might be well-spent in Tyrol′s capital Innsbruck.